Taser Int. (TASR) started trading day with a renewed sell off. It opened at $12.88, briefly raised to $13.02 a share and then continued sharply lower. Within an hour the stock dropped all the way down to $11.97 a share. Weakness I could see on my indicators along with the price action convinced me that it would be a good idea to roll my put positions lower and further in time. Although yesterday it looked like my put contracts are still safe – have enough time and the selloff wasn’t large and strong, this morning the situation changed. 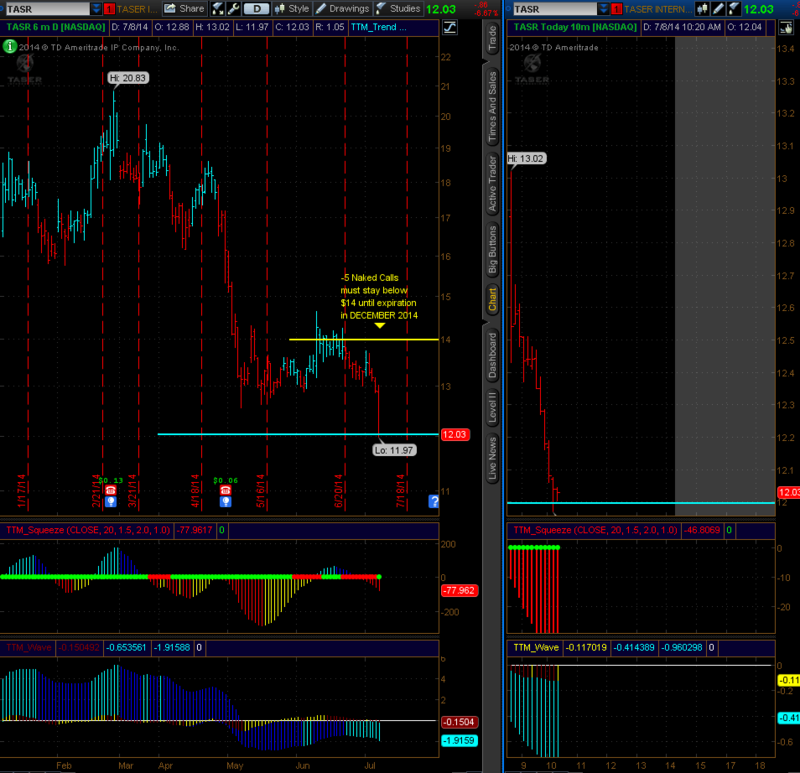 TASR under a sell off today morning convinced me to roll down my puts to protect my trade. Investors are pessimistic about this company, so I expect more rollovers of my put trades. This price action convinced me about the weakness in the stock so I decided scale into more naked calls against this stock to generate cash available for protection of my puts. Now the stock needs to stay in the range 12 – 14 a share. If that happens I will realize full profit as both sides of this trade expire worthless and I will keep premiums from puts as well as from calls. If any of the side gets breached, I will roll that leg again down (or up in case of calls) and further away in time. I will keep you posted on this trade.